Diamonds with VS2 and sometimes even SI1 clarity grades don't have inclusions you can see so why pay more? We’ve certainly seen SI2 clarity diamonds that are beautiful. But we’ve also seen many SI2 diamonds like this. Diamond clarity is based on the number, size, relief, nature, and position of inclusions. SI2 clarity diamonds have noticeable inclusions that are very easy for a diamond grader to see using 10x magnification. We think if your diamond is bigger than a half-carat in size you’ll have no trouble seeing them either. 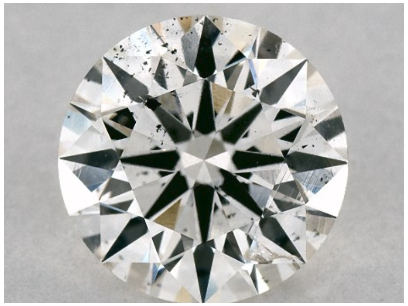 The more inclusions there are in a diamond, the more they affect its overall appearance. But the size of inclusions is even more important because the bigger the inclusion, the more likely you are to see it. That’s especially true if an inclusion is a contrasting color. Black inclusions are much more noticeable than larger transparent or white inclusions. The location of inclusions is one of the most important clarity factors. Diamonds with inclusions in the center of the table are the easiest to see. Diamonds with inclusions near the pavilion can reflect like a hall of mirrors so you see a single inclusion more than once. We see this a lot in SI2 diamonds. Types of inclusions include pinpoints, clouds, crystals, needles, knots, feathers, cleavages, internal grain lines, twinning. Types of surface blemishes include polish lines, scratches, naturals, indented naturals, cavities, chips, and bearding. In SI2 clarity diamonds, ROSI looks for inclusions that are transparent, even if they are large. ROSI never recommends buying a diamond that has chips, knots, etched channels, or manufacturers remnants because they affect a diamond’s beauty and durability too much. 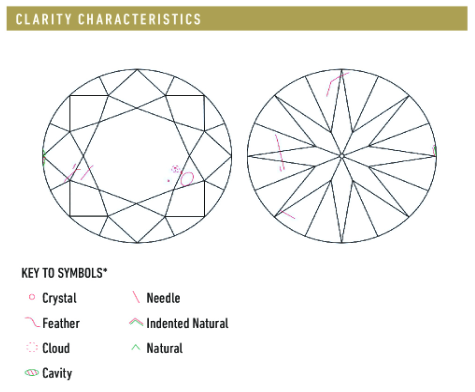 ROSI also automatically eliminates diamonds that have a feather inclusion in the corner or point of a fancy shape, which may be a durability issue. This Si2 diamond has a large cloud and also a large needle. But we don’t think either is as noticeable as the black spots in the first SI2 clarity diamond. Either one has better clarity than the diamonds sold at chain jewelry stores and mass merchants, who generally carry Included or I clarity diamonds. If you select your SI2 diamond carefully (or let ROSI, our diamond-picking artificial intelligence powered by IBM’s Watson do it for you) you can find a nice-looking diamond at an excellent price. We think that diamonds with VS2 clarity grade offer you the best balance of beauty and affordability. But if your budget is limited, finding an attractive SI2 diamond may be a good choice to stretch yiur budget. ROSI recommends VS2 clarity diamonds as the best balance between quality and value because you won't see the inclusions with the naked eye. 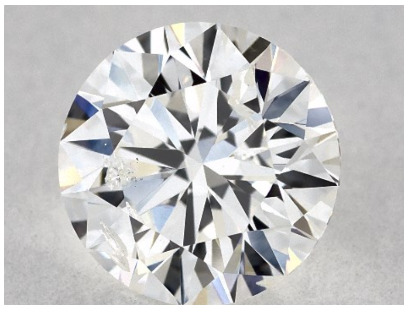 But if your budget is limited, ROSI will evaluate the size and position of the inclusions in SI2 quality diamonds to find one that doesn’t have easily noticeable inclusions.